The UC Clermont College volleyball team doesn’t back down from a challenge. The Cougars routinely play a difficult schedule and that helped the battle-tested squad finish fifth in the national tournament in 2017. Head coach Josh Hamer said 2018 should be another competitive season. The Cougars will be led by a returning USCAA first-team All-American in Kelsie Holland, who also led the United States Collegiate Athletic Association in single digs and in digs per match. Kim Davis is a talented sophomore who was a stand-out player at Scott High School in Kentucky and should be primed for a breakout season. Junior Ashley Fraley is the team’s defensive specialist, and Sophomore Zoe England is the team’s setter — both could also be big contributors this season. Hailey Fannin is a promising freshman from Eastern Brown High School. Hamer said the team’s success in 2017 has been a motivator for the returning players. “They got a taste of success last year and that sparked their offseason work because they want it again,” he said. 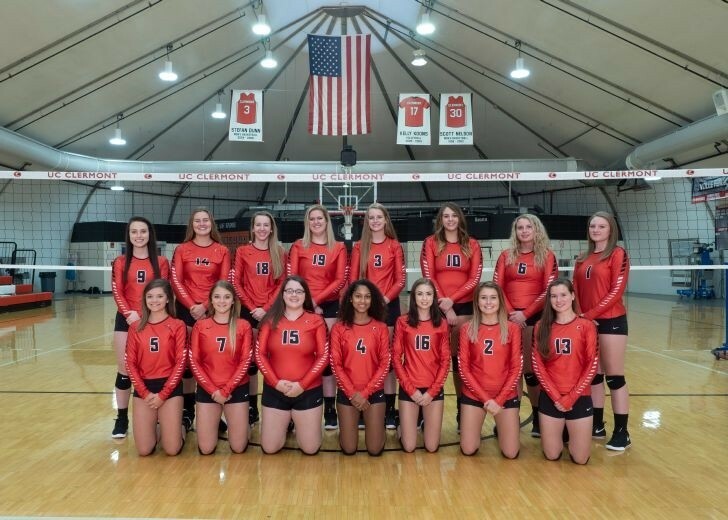 One big challenge for UC Clermont, though, will be their 35-match season, including a few stretches of four matches per week. “The grind of a long season and staying healthy against a tough schedule can be hard,” Hamer said. The Cougars have some big matches this season, including another trip to Carlow University in Pittsburgh. The Cougars defeated the powerhouse program on their home court in 2017. One positive that will help, said Hamer, is the strong communication among players that he already sees developing. You can catch that cohesion in person on Sept. 4 at 7 p.m. as the Cougars face Midway College at home. The team will also host a tri-match against Hocking and Welch colleges on Sept. 8 beginning at noon. Home games are played in the Student Activities Center on UC Clermont’s campus, 4200 Clermont College Drive, Batavia, Ohio 45103.